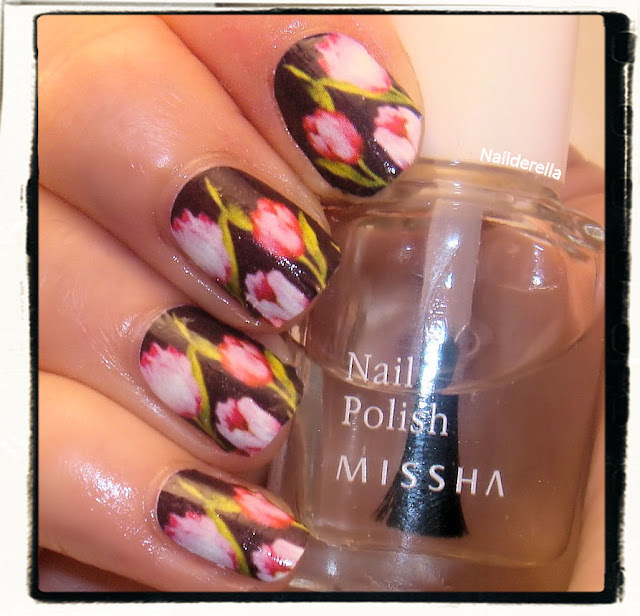 Easy flower design on your nails! Today, I'll do a review a sample I received from the Chinese online store called "KKcenterHK". It's a shop specialized in nail art products but also make up, false lashes and so on. Concerning nail art, they have some stamping image plates, water decals, glitters, stickers, and polishes (OPI, Zoya). Finally it wasn't that difficult to use. Application was rather easy. I first thought I would have to cut the pattern to fit my nails but in the end I just used them as they were and it was all right, I think. I was lucky but if your nails are larger or thinner than the pattern, this might be an issue and discourage you from using water decals. I didn't resized them but I guess this would be a little difficult...not unmanagable but a little difficult. On these pictures I didn't use any top coat but I tried adding a layer of top coat after my photo session and it helped setting the pattern on the nails. However you have to be careful not to touch your nails before it's competely dry otherwise the pattern will get damaged (I did that on one nail...). Final Verdict: In the end, I was quite happy with this product because you can get very easily and quickly a very nice pattern on your nails. However, I'm still a little scared it won't last very long (although I didn't do a lasting power experiment). So I will rather use this kind of products for a particular occasion when I want to have stylish nails with some fun designs! Another alternative would be to use a water decal on only one nail as an accent nail...I guess I would wear more water decals in this way. 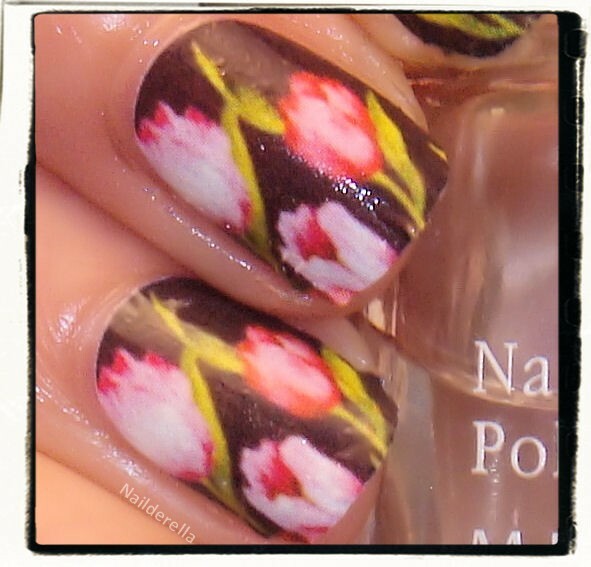 And you, what do you think of water decals? Have you ever tried? Are you willing to? This set of water decals can be purchased at KKcenterHK for $4.50. There are 10 decals per package. This is a little sad because this means you cannot mess a single nail...unless you've decided to use them as accent nails rather. There are instructions written in English at the back. Basically, you have to cut the image you want to use, peel off the plastic foil that is on the water decal. Then take it with a tweezer and put it in water for 10 sec. 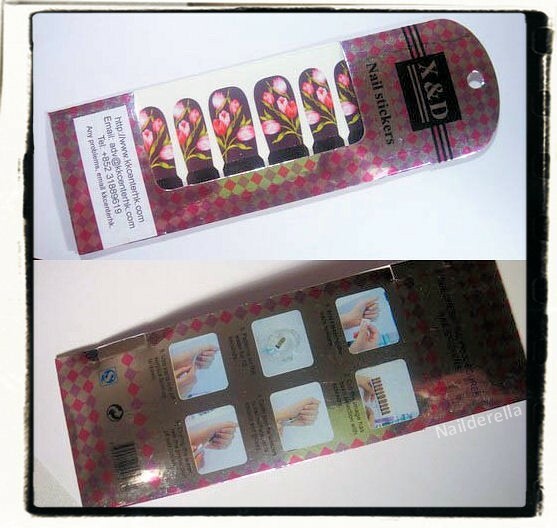 After this step, you can peel of the decal from its support, place it on your nails, expel the air bubble ,smooth it on your nail, and trim down the excess of pattern. Apply a top coat and you're done! You can follow this tuorial by Delaney. It's in French but no need to understand because you have the images! That's so pretty, I've never tried any kind of full nail decal before but I really want to. That one is really cute. I love that pattern! Great manicure! This is really cool-I like it-very different! Nice review it came out very pretty and it's sounds pretty easy.